The holidays are over for another year. Now the tree needs to be packed away, and left in its place is a month’s worth of dust and a reminder that your home needs a thorough cleaning! The easiest way to tackle your mess is to not let it accumulate at all! Here are some big benefits to keeping your home clean regularly! A clean home, is a healthy home! If you keep up to date with surface cleaning, scrubbing and sanitizing your space there will be little chance for dust, allergens, bacteria, and viruses to accumulate and cause health issues to you and your family. Disinfect high traffic areas like the kitchen and bathroom to reduce mold, mildew and other pathogens from building up and reduce your chance of illness all year round! Get your exercise! Did you know that cleaning counts towards your physical activity? It’s true! 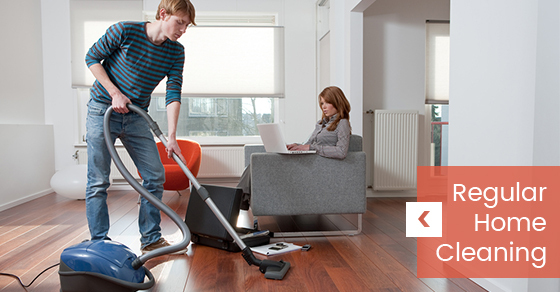 Each time you sweep, vacuum, mop and scrub you are using muscles and counting steps! No need to run to the gym when washing windows, and scrubbing sinks gets the heart rate up! Clean kitchen, better nutrition! Did you know that a clean kitchen encourages you to seek out your inner chef and prepare healthier meals in the home rather than opting for take-out? No one wants to cook or eat in a messy kitchen, but a clean and organized space fosters creativity and healthy eating! Reduce your stress! A clean home fosters an environment for rest, relaxation, and stress-free behaviour. It is more inviting to you and your family to sit and enjoy your space, rather than worrying over tidying. If a little bit is done everyday to maintain cleanliness, then there is no stressing over a large cleaning job. Get everyone involved in daily maintenance; if everyone does a little then no one does a lot! Guest-Ready! When your house is always clean and inviting, you are more likely to be sociable and happy because your home will always be guest ready. Prepare to be the hostess with the mostest, as people will feel drawn to your inviting space! For these tips and more benefits on keeping a clean home, see our link below or contact us at Sunrise-Cleaning to help get you started on an easy and affordable cleaning regime that will keep your home looking it’s best!